A Testimony: God saved Feb Jnr.! This week I was reminded once again just how much God loves me and how He has given his angels charge over my family and I. 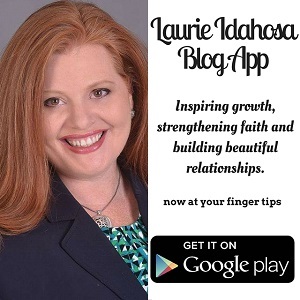 My heart is deeply full of gratitude as I share this testimony with you. God has blessed my husband and I with three boys (Feb, 7 Nate, 4 and Judah 2). 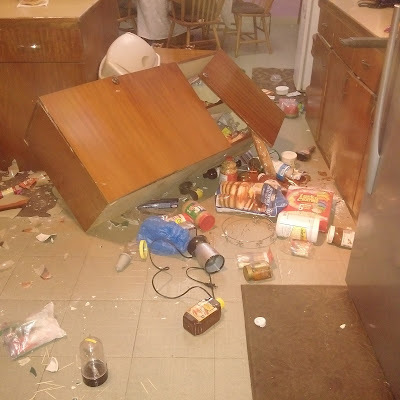 On Sunday night I was putting the younger two to bed, when I heard a loud crash coming from the kitchen. 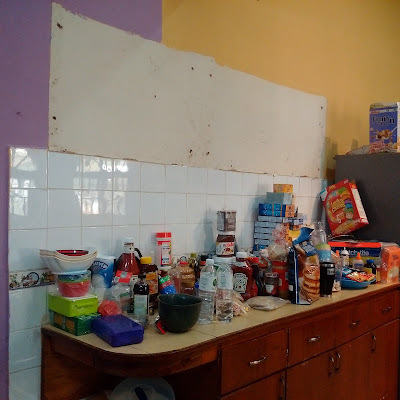 The sound of it alone was frightening; running towards the source of the crash I found my kitchen covered in dust and broken glass, with a cabinet that was previously attached to the wall, on the floor! Immediately, I started shouting for Feb Jr. (my oldest son). "Feb, Feb, where are you???!! Are you okay?" One of my assistants at home, Eunice answered me, "Feb is okay, we are all okay." I started thanking God for His divine protection, amazed at the destruction in the kitchen. We were truly shaken by the thought of how bad it could have been if the cabinet had fallen on someone. As we were praising God, Feb Jr. comes over to meet me with a stream of blood coming down his face! He was clearly traumatized and shaking and looked me in my eyes, "Mommy, am I going to die?" Before I even knew the extent of his injuries, my answer to him came from a position of faith. "Feb, you are not going to die. You are going to be okay." For a moment, I was in disbelief, I had already started thanking God that nobody was injured, and now, I see that my precious boy is bleeding profusely from his head. I applied pressure on the wound to stop the bleeding and called my Mother in Love to ask for her assistance in getting me someone to take us to the hospital as the injury looked serious. Fortunately, my brother in love, Rev. Wale Ajayi came running to the house in his bare feet with our dear friend Shadrach Ruwan who was visiting at the time. They helped carry Feb into the car and we rushed off to Faith Mediplex Hospital. Shortly after we arrived, the hospital was full of people praying for Feb and looking for how to help. To my amazement, even my mother in love, Archbishop Margaret Idahosa left her home, at that late hour of the night and stood by our side till Feb’s treatment was done. She is a grandmother in deed. God is such a Great God! 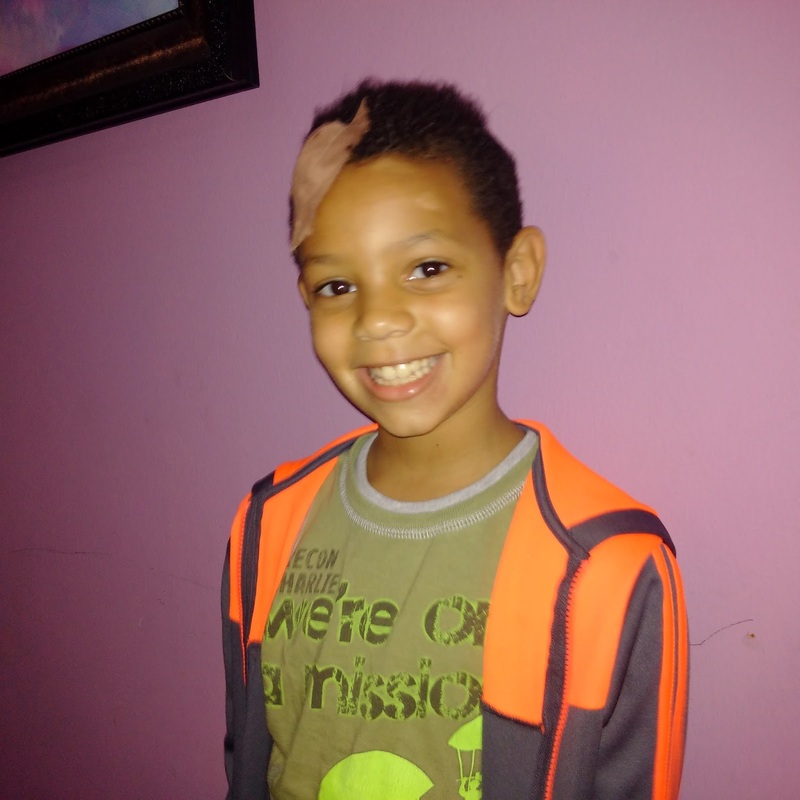 Although Feb Jr. needed a few stitches to close up the laceration on his head, he is otherwise perfectly fine! God saved him from what could have been a truly heartbreaking story to tell. After he calmed down from the incident, he explained to me what had actually happened. His narrative alone made me fall to my knees in gratitude to God. He explained that he had climbed up onto the counter top to look for a snack in the upper cabinet. While doing this, his shirt got caught on the cabinet handle and caused him to lose his balance. He fell from the counter top and dragged the whole cabinet down on him. Thank you Jesus, for your divine protection! You keep and preserve your children. I'm forever grateful to the King of Kings and the Lord of Lords for keeping a smile on our faces and for protecting my children. I am quite sure that the Angels of the Lord cushioned the impact of that cabinet and saved the life of our son. Feb Jr. woke up feeling just a slight headache but spent his morning happy, playing video games and eating Mommy's pancakes. Just to be on the safe side, I have had other doctors examine him and they all say the same thing. "Feb is okay, all the Glory belongs to God." All morning, I have been meditating on Psalms 91 and giving God praise! We have so much to be thankful for! 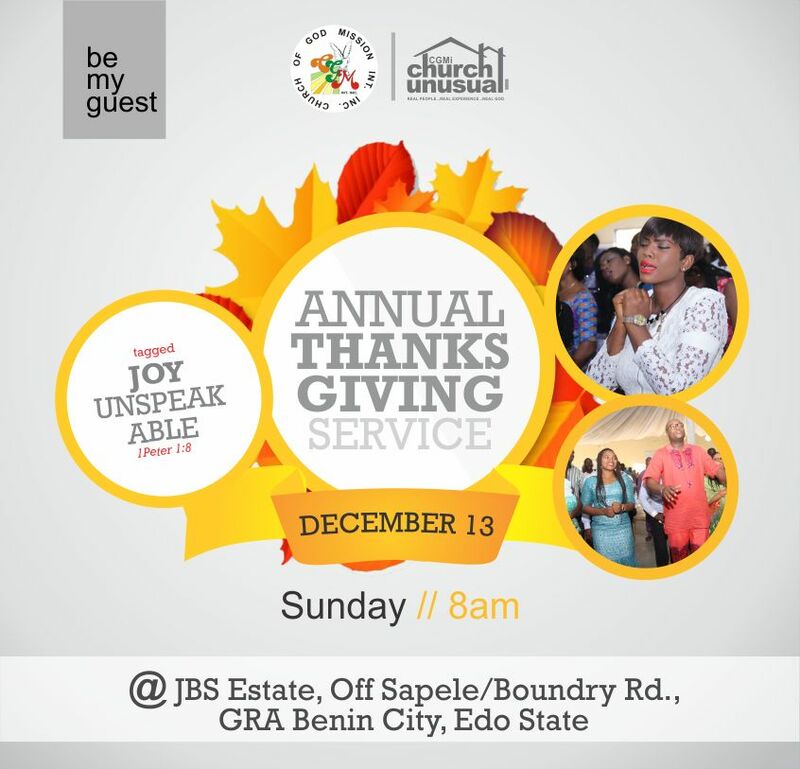 You can join me as I give God thanks for this testimony and many others during our Annual Thanksgiving on December 13th, CGMI Church Unusual, JBS Estate, off Boundary, Off Sapele Road, Benin City... 8am prompt! We are grateful to God for His mercies and mighty deliverance over Feb. Jr. Life. God is always on time. Warm regards to everyone. God be praised for His timely intervention. In the shadow of his wing, there is protection. All Glory to God!!! We can't end this year in tears. God forbid! God be praise .He is awesome. God is good! I rejoice with you Ma. A House full of Angels! Glory to the Lord our Safety. Thank you Jesus for your faithfulness in saving Feb Jr. This testimony is proof of how faithful God is and always would be! God clearly averted a potentially very serious domestic accident. This is the mighty hand of God and Him alone be praised! I'm so thankful for the handsome boy! Feb Jr. you shall not die, but you shall live and declare the works of the LORD upon your life. God will continue to protect you and Guide you. Praise God for divine protection! He is so faithful. Kiss little Feb...May he heal speedily. We give God all the glory for the life of Feb Jnr. I read your blog with my mouth open wide. My heart is still beating fast from the suspense. Wow! God I thank you! Sheeww! Glory to God!! Indeed those that put their trust in the Lord shall never be put to shame!! Praise God! It will always end in praise! Awesome God!!! He cushioned the fall. Awesome God!!! Thank you!!! Glory be to Jesus, our God is for ever faithful. Wow! What can we say? If God be for us, who can be against us. I celebrate God with you ma. Jesus is Lord. Nothing will intercept our joy in Jesus Name. He has made a promise to keep and protect you from all evil and danger. He is faithful to His word. Praise God for his protection over your family! God be praised... He keeps His own! we serve an amazing father. Glory be to God in the Highest, Amen! For His mercy endureth forever, Amen! Glory to God for the victory. He causes us to triumph always. God is faithful indeed. His children are most precious, Feb Jr is a living testimony . May his name be praised. Glory be to God. May His name be praised. I rejoice with you ma. We truly rejoice with you my sister. To God be Glory. Thanks be to God for HIS infinite mercies! Rev Gaius Okwezuzu, BIU Family Member.